There are few places on Earth that showcase the extraordinary beauty and diversity of life as in the Amazon Rainforest. The Amazon is the world’s largest rainforest and river system and spans across eight countries and one overseas territory, through Brazil, Bolivia, Peru, Ecuador, Colombia, Venezuela, Guyana, Suriname and French Guiana/ France. 40,000 plant species, 1600 species of tree, 3,000 freshwater fish species, 1600 bird species, 1000 amphibians, 400+ mammals and more than 370 types of reptiles. This of course doesn’t take account of the myriad of insects and invertebrates that live there. 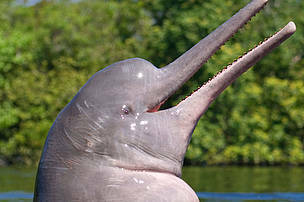 It is one of Earth’s last refuges for animals such as jaguars, harpy eagles and pink dolphins; a recent report by WWF confirmed that scientists are discovering an average of one new species in the Amazon every other day. Also, more than 30 million people, including 350 indigenous groups live in the Amazon and depend upon it for their shelter, food, agriculture and livelihoods. The Amazon rainforest and river provide such a unique and vital ecosystem that benefits us all, it is quite breath-taking and heart-breaking in equal measure. Today I want to tell one of the many stories of the Amazon, about an area along the vast Amazon River, how it is like nothing else anywhere on Earth and why it matters. The Amazon River, travels from high up in the mountains of the Andes across the continent for 4000 miles through dense rainforests and cities to the Atlantic Ocean. It is responsible for about twenty percent of all the fresh water that flows into the world’s oceans. In Earth’s geological record, the Amazon River is thought to be around 100 million years old. Along its length, the river provides life to all, animals, fish and humans alike, it rises and falls as the seasons change increasing its width to almost 25 miles (40km) during the monsoon seasons. Following the Spanish and Portuguese discovery” of the Americas, the New World, there were many expeditions up and down this great river in search of the people and places that had long been talked of. The Amazon River was named after one such expedition in 1542, by the Spanish Conquistador, Franscisco de Orellana; he was part of a larger expedition in search of the city of El Dorado. As the legend suggests, Francisco and his party were separated from the main party and he made his way down the Amazon River to the Atlantic Ocean and to a Spanish Outpost. It is believed that he named the River after some female warriors he encountered on his journey who reminded him of the Amazons from Greek Mythology, a tribe of women who were the daughters of Ares, the God of War. A good story if true but however it was named, the Amazon River stands the test of time. The very nature of the vast area, with its thousands of tributaries through dense rainforest and almost impenetrable terrain in parts, mean that many legends and mysteries surrounding the great river that have been told for centuries. One such legend was given credence by a Peruvian Scientist in 2011. It is of the existence of the Boiling River; Peruvian locals have talked about such a mystical and healing river in the Amazon for generations. 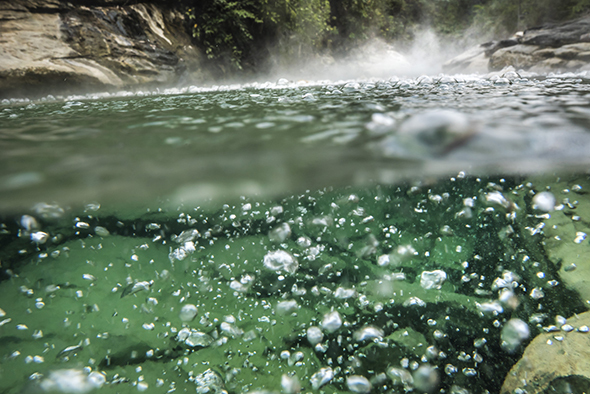 While many dismissed the idea of a boiling river where anything would be killed that fell into it, as mere folklore, a geophysicist named Andrés Ruzo has been studying this apparent geological anomaly of nature since 2011. For Peruvian geophysicist, Andrés Ruzo, the myth had fascinated him since childhood. As a child growing up in Peru, his grandfather would tell him of the legend of the Spanish conquistadors who foolishly ventured into the rainforest in search of gold, and the few men that returned told stories of poisoned water, man-eating snakes, and a river that boiled from below. The mystery of the Boiling River lingered with Andres. When he finally became a geologist and was completing a PhD on geothermal energy potential in Peru, he began to question whether the river could be real. He spoke with as many people as he could to find to see if it could be possible for such a river to exist. According to the many experts he spoke to, the answer was a unanimous “no”. Why? Well because whilst hot rivers can exist, they are generally found near volcanoes. the right subsurface plumbing system to get all that water from beneath the ground to the Earth’s surface. Deep in the Amazon Basin and along this area of the Amazon River there are no volcanoes and or other powerful heat sources. Indeed, the nearest volcano is about 430 miles away from this part of the Peruvian Amazon. So, from what was understood at that time, this Boiling River had to be nothing more than a legend. But Andres Ruzo could not forget about this and wanted to be sure for himself. So, when he went home to Peru he asked his family where the myth had come from; his grandfather had told him the stories but where did he learn of it? His aunt told him that she had swum in the River before and his uncle confirmed this for him. He was incredulous, it seems people do swim in the river, but only after heavy rainfalls when it’s diluted with cold water. More often, the water is used to make tea and for cooking by the local people of the area. That it was decided, he knew he had to see this for himself. So, in November 2011 Andres and his Aunt went on an expedition to central Peru to see the Boiling River. The nearest city to the area of the small town Mayantuyacu where the Boiling River can be found is Pucallpa, a journey took of about four hours, including a two-hour drive, 45-minute motorized canoe ride, and an hour hike along muddy jungle paths. Local people have long been afraid to go into the jungle around the area of the Boiling River, where the Mayantuyacu area is now. They believed that part of the jungle to be home to very powerful spirits and animals. The river is protected by the shaman (healer) of the small town Mayantuyacu, a secluded healing center. The name “Mayantuyacu” was chosen to honour the spirits, “mayantu” for the spirits of the jungle and “yacu” for the spirits of the water. The only people who were brave enough or were given the power to safely visit the area were the most powerful shamans, there they would commune with the spirits and learn their healing arts. (NB A shaman is a spiritual healer who has the power to connect nature with the spirit world and use that connection to restore the body. They are leaders and held in very high regard by the indigenous people). According to Maestro Juan Flores (shaman and elder of Mayantuyacu), the Boiling River has always been regarded as a place of tremendous spiritual power. When Andres and his Aunt arrived he could not believe his eyes. the river was steaming hot. The mud of the riverbank was too hot to walk on, and if you fell in your skin would be covered in third-degree burns in less than a second. The most puzzling part was the sheer size of it. So, for Andres, a Peruvian, a scientist and a geothermal physicist, to see this river, on this scale was staggering. The area where the Boiling River is found, is an area with 3 geologically unusual non-volcanic thermal rivers. The Salt River (a salty thermal stream), the Hot River (a thermal freshwater stream), and the Boiling River. The Boiling River is the crown jewel of the area—with boiling and near-boiling hot springs feeding its large thermal flow. It flows hot for approximately 4 miles (over 6 kilometers), gets up to about 80 feet (around 25 meters) wide at its widest point, and around 16 feet (about 5 meters) deep at its deepest point. There are numerous thermal waterfalls along its course, the most impressive of which boasts a drop of about 20 feet (close to 6 meters) into a large thermal pool. The Boiling River or Shanay-timpishka—the ancient name loosely translating to “boiling with the heat of the sun.” is marked at its headwaters with a boulder in the shape of a snake’s head. According to legend, a giant serpent spirit called Yacumama or “Mother of the Waters” who gives birth to hot and cold waters heats the river. After getting special permission from the shaman to study the water, Andres had to work on the condition that any samples of water taken from the river should be returned to the earth so that they can find their way to the Amazon. And so his studies started. He and his team had many trips to the area with some incredible results. The nature of the area defies what was currently thought about geothermal features. It had to be an anomaly. After testing different hypotheses, Andres and his research colleagues came to the belief that the vast volume of water that falls on the Amazon basin and the River finds deep-rooted faults where it travels down into the earth’s crust. As you get deeper into the earth’s core, the temperature rises and so the water is heated as it seeps into the ground (this is known as the geothermal gradient). This hot water is then fed back to the surface through faults and cracks, arteries if you will and when they come to the surface they do so as these thermal springs that heat up the river for 4 miles. Chemical analysis has revealed that the water in the river originally fell as rain. The waters could be coming from as far away as glaciers in the Andes, then seeping down deep into the earth, getting heated up by the geothermal gradient and re-emerging in this point of the Amazon basin coming out to form the Boiling River, all due to this unique geologic setting. Andres and his team have returned every year since 2011 and will continue to study the river and its source. In addition to the amazing features of the River the area surrounding the river is rich in biodiversity. They have been cataloguing all the species they find and have already found many unique species to science that can survive these boiling temperatures. The jungles surrounding the Boiling River have become a sanctuary for wildlife fleeing deforestation in the surrounding areas, which have been totally cleared for agriculture. There is still more work to be done in cataloguing and documenting the plethora of Amazonian plants and animals that call this jungle home. Due to the unique nature of the area, Andres’ main concern is how to protect the environment and its surroundings from the rapidly advancing deforestation. He is working with Governments to establish the area as a protected site. Since his initial visit in 2011 to the Boiling River, the trip from Pucallpa has been reduced to a three-hour direct drive because of the rapid deforestation and commercialization of the area. To preserve the sacred river, Andres Ruzo started the Boiling River Project to protect and study the natural wonder in a safe manner. The Amazon has been variously called the heart of the world or the lungs of the world because of the river’s numerous veins feeding water through to the earth or its capacity to exchange gases with the atmosphere. There are 600 billion trees in the Amazon rainforest for example and with the heat of the sun, each tree every day transfers 1,000 litres of water into the atmosphere through transpiration. 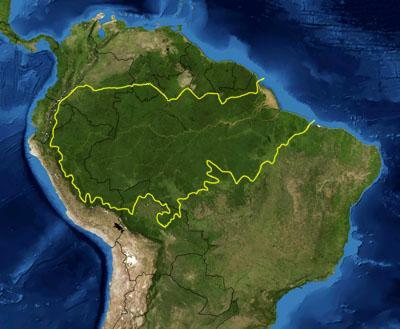 Throughout the entire rainforest this equates to 20 billion metric tons of water in one day. Scientists have recently discovered that this water vapour released in to the atmosphere creates low level clouds which then falls as rain in the forest. This rain encourages the air to circulate and draw in more moisture from the oceans which makes it rain even more. Through transpiration, the Amazon rainforest is responsible for creating 50-75 percent of its own rain. But that natural process has a much wider reach with Amazon rainfall and rivers feeding regions that generate 70 percent of South America’s wealth. Studies indicate that moisture from the Amazon influences rainfall as far away as the Western United States and Central America. Without trees, there will be no transpiration which in turns impacts the level of rain which of course affects water supply and brings drought to areas. Through a concerted effort by Governments and environmental agencies alike and the introduction of various initiatives deforestation in the Amazon rainforest was in decline after 2004, mostly due to the falling deforestation rate in Brazil. But sadly since 2014, deforestation is on the rise again, through logging, fires and land clearance there is a decrease in forest transpiration and a lengthening of dry seasons. In recent years, São Paulo – the biggest city in South America – is facing its worst water shortages in almost a century. Of course, trees not only absorb carbon dioxide from the air, they also store carbon in their roots, leaves and trunk. Trees in the Amazon rainforest hold 48 billion tons of carbon and so when trees are cut down, tons of carbon dioxide is released into our atmosphere, with the negative impact that has on our environment. In a recent study cited in September 2017, the results for the Amazon are worrying. What they have found by combining studies over the last 12 years in major parts of the world where deforestation is occurring, the carbon that is released into the atmosphere is greater than that taken in, giving a net carbon loss, a situation that must be reversed. They found a net carbon loss on every continent where deforestation occurs. Latin America – home to the Amazon accounted for nearly 60% of the emissions, while 24% came from Africa and 16% from Asia. I’ll link to the study for those interested, in the show notes. So, for the millions of people, animals and plants that rely on and live in the Amazon and for the millions of us who benefit from its survival, we must protect and preserve it for now and for generations to come. The Amazon rainforest and river and all it holds is a reminder that there are still great wonders to be discovered. They are everywhere, every day often in the things we barely notice, the things we almost forget. So, there it is, one story in this vast, unique, diverse, important and essential part of the world but it has stories such as these along its length and width. “There remains so much to explore. We live in an incredible world, a world where shamans still sing to the spirits of the jungle, where rivers do boil and where legends do come to life. To listen to this as a Podcast you can download it from the website page, Apple Podcasts, Stitcher, Spotify, TuneIn or wherever you pick up your RSS Feed. Thanks I’m glad he found it useful!